A wind turbine is a rotating machine that transfers kinetic energy from the wind into mechanical energy. If the mechanical energy is used directly by machinery, such as for pumping water, cutting lumber or grinding stones, the machine is called a windmill. If the mechanical energy is instead converted to electricity, the machine is called a wind generator, wind turbine, wind power unit (WPU), wind energy converter (WEC), or aerogenerator. 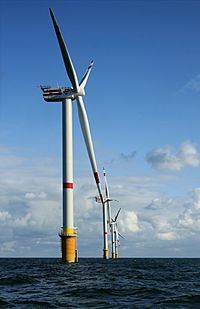 The wind turbine's blades are turned by the wind. This turns a shaft turning at about 15-20 rpm with a high torque. The shaft goes into a gearbox with a ratio of about 1:50. This is then creating an output of around 1000 rpm but at a low torque. It is connected to a generator which uses magnetic fields and wire to create electricity. This can then be used. Although wind turbines are a renewable source of energy and don't pollute the environment, they have an environmental impact. Many people think that wind turbines create a lot of noise and look ugly. However they don't produce as much noise as some people think. 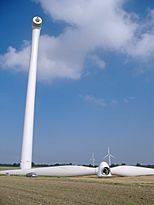 A wind turbine with its rotor blade dismounted for maintenance; please note the car in the picture, an Opel Astra G convertible, which is there for scale. Wind turbine Facts for Kids. Kiddle Encyclopedia.